There's something about drinking tea out of a thin vintage tea cup that makes it taste so much better. Every sip takes you to a serene place where relaxation is a must. 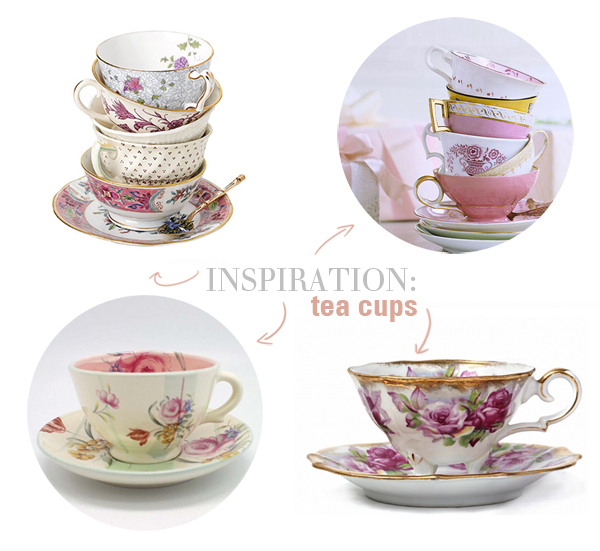 Besides feeling uber classy while sipping pinkie's up, vintage tea cups hold a special place in my heart because of the different designs each one is decorated with. It's a personal goal to own a collection of tea cups with unique patterns like these on each one! There's also the fact that they make me feel a little British, which is definitely ok with me! Tea cups like this make one of my favourite past times, enjoying a soothing tea, a special occasion each and every time! I'll take a crafted porcelain cup over a flimsy paper one (that typically leave your hands scorched) any day! Not to mention they're accompanied with matching saucers and little tiny spoons, how much cuter can they get? !